Have you ever needed to globally replace or delete some data in a DataFlex file? Or, only some of the records based on a selection of some kind? Within some limitations, this program will do all of this, and into the bargain it can be made to use an index to speed up this process. Do you remember the old DOS "Scope" program from Compuserve? This is a direct descendant of that old program but updated with much newer methods and concepts. All global variables have been replaced with properties and the macros replaced with the newer API calls for obtaining file and index information. The program uses indirect_file as the means of finding the data to replace, and also for jumping in and out of the indexes. 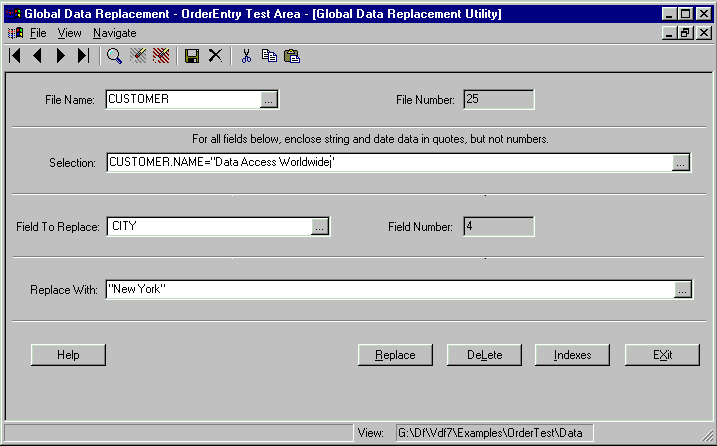 Given the proper selection conditions, globally replace data in all records or some records in a DataFlex data file. Records may be deleted by entering selection criteria. If replacing data, an index may be selected, and the program made to jump in and out of the index. VDF 8 vs all previous versions. The current version will compile and operate under VDF 8 if the "define VDF8" line near the top of Global.src is uncommented. You would have to create a workspace as normal. A standard workspace will work nicely for this application, create one with dbBldr and unzip using the paths in the zip file. The help text file is located during operation by finding the current workspace help directory. The entire application is IDE compatible with one exception. The menu that the IDE normally places into the .src file is not really applicable to this application since it isn't data aware as the normal application is. For that reason you will need to register the menu file with the IDE if you want to modify the program code. Enter a file name, use F4 or the prompt button to fill in the file name. Enter the "Selection" by pressing F4 to select the File.Field, and add on the limitations if any. you need to do is manually enter the operators and data. and so forth. Be sure strings and dates are enclosed in quotes. Select an index if desired (see section below) and click the "Replace" button. Follow steps #1 & 2 only. Deleting does not use indexes, so don't bother. Click on the index button. Select an index using the popup. Enter jump-in data. This data assumes the first segment of the above index will be the field used for this. Do NOT enclose any data in quotes for index jumping, in or out. to change, and the jump-out for just after. If you click on "Cancel" the index entries will NOT be used. This application uses a number of useful techniques that aren't ordinarily found in the standard DF application. Some of these are indirect file handling, the Eval function, and a lot of manipulation of file and field attribute information. Since the application isn't data aware, all of the lookup lists have been manually created from the list class. Update to VDF 15, though it should work nicely with VDF 14. Change all Recnum references to the primary index of the table being updated. Bug fix for index "jump in." This verson of Global has been designed for VDF 12 and later. All of the Studio tags have been removed and the workspace code changed specifically for 12. Parts of the code have been rewritten to take advantage of newer technologies, such as using the array datatype for multidimentional arrays, the workspace selector, cRegistry class and html help. GlobalDataChange 1.2 release and read the readme.txt file. The application is IDE compliant. GlobalDataChange 1.1 release and read the readme.txt file. The application is IDE compliant.